But Ukraine's top prosecutor says NABU investigators overstepped the law in a recent probe of suspected corruption in Ukraine's migration service. FILE - A member of the National Anti-Corruption Bureau of Ukraine stands guard next to a defendant's cage during a court hearing in Kyiv, April 21, 2017. General Prosecutor Yuriy Lutsenko told parliament he wanted to address issues around "the relationship between various law enforcement agencies that causes public outrage and rather harsh statements by our strategic international partners — the U.S. and the EU." "A joint [FBI-NABU] operation ... is an absolutely illegal action without the relevant legal procedures," Lutsenko said in a recent television interview, according to a report by The Wall Street Journal. In an interview with VOA, NABU Director Artem Sytnyk defended actions of his undercover agents, as well as the agency's cooperation with FBI. "This is about the survival of the corrupt elite," he said. "It further proves that it is impossible to investigate corruption at the highest level and not run into resistance." In a statement to VOA, FBI spokeswoman Samantha T. Shero said the law enforcement agency entered into a June 2016 Memorandum of Understanding (MOU) with NABU to provide investigative assistance, training and capacity building for NABU and Ukraine's Special Anti-Corruption Prosecutor's Office (SAPO). "The FBI abides by host nation laws and never operates outside the MOU," she said, explaining that FBI personnel are temporarily assigned on a rotational basis at NABU in support of this relationship. "These special agents and analysts are not operational, and any statements to the contrary are not true," she said. "Rooting out corruption is a priority for the FBI and we routinely work with our foreign law enforcement partners across the globe to investigate corruption and provide assistance when requested. We value our relationship with NABU and SAPO, and have found their staff to be professional and trustworthy. NABU and SAPO are young organizations that face enormous challenges in the work that they are doing in Ukraine." FILE - National Anti-Corruption Bureau of Ukraine Director Artem Sytnyk attends a news conference in Kyiv, Aug. 18, 2016. In an interview with VOA, Sytnyk defended actions of his undercover agents, as well as the agency's cooperation with FBI. The FBI, Shero added, will continue to provide NABU and SAPO with support and assistance in their "important work for the Ukrainian people." 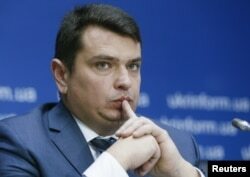 On Thursday, an opposition legislator who chairs the Ukrainian parliamentary anti-corruption committee was dismissed by fellow lawmakers, in what critics of President Petro Poroshenko's ruling party are calling an open assault on NABU, the country's only independent corruption watchdog. The office of Ukraine's general prosecutor and Poroshenko's government have come under increasing pressure in recent weeks amid perceived backsliding on reform commitments, which has delayed billions of dollars in loans from the International Monetary Fund and tested the patience of Western countries, even as Kyiv pushes for closer EU integration and possible membership. Ukraine's general prosecutor on Wednesday denied that his office was impeding NABU's work as he sought to deflect charges by Kyiv's Western backers that Ukraine was coming up short on promises to fight graft.